A bit of an oversight that I’ve not written about Mrs Atha’s yet. It’s been open for absolutely ages and I’m well behind the curve in terms of up to minute coffee reporting. I’d walked past a few times and made a mental note to find the time to visit, then ended up visiting a few times in a flurry of coffee activity. 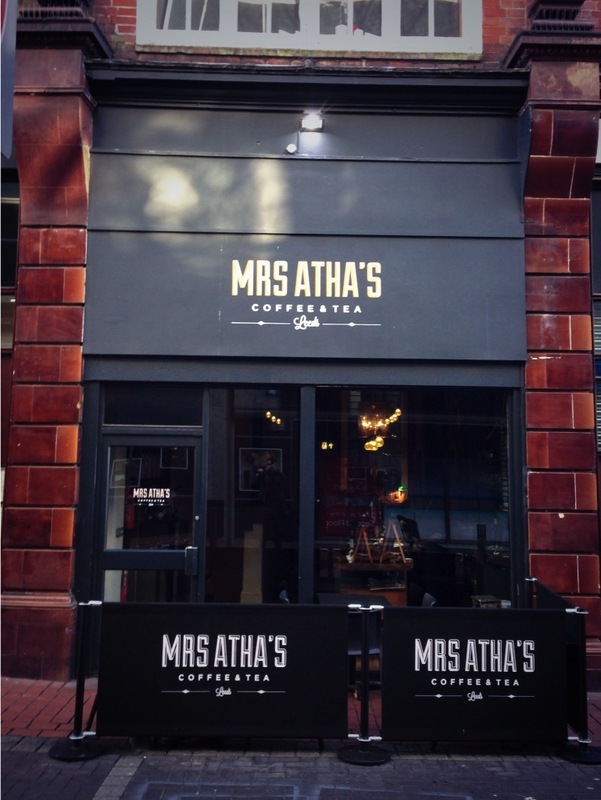 It’s worth saying a lot of time and effort has gone into the design of Mrs Atha’s, from the branding to interiors and beyond. I always spot this first up as it’s the business I’m in but I am a big believer in businesses that get this right always get the product right too. Other nice touches like Aesop hand wash in the toilets—the only place in Leeds that does so— tell me there is an eye for detail at work here. The first time I visited it was a quick coffee and I settled at a table waiting for my friend to turn up, I marveled on how Mrs Atha’s actually makes you feel cool just sitting in it: like you’re in the know, and that’s hard to pull off. It’s also hard to pull off a genuine coffee alternative contender in a city dominated by corporates but Layne’s Espresso, Bottega Milanese and a handful of others have done it, so if you get your offer right, it can work. I have bemoaned the lack of a genuinely great breakfast in Leeds but with Mrs Atha’s we do have a contender. It’s not your standard full English but a component led version, using Lishman’s bacon and sausage, thrillingly creamy scrambled eggs,delicious sourdough toast and buttered crumpets. Team these up with simply great coffee then we have something really good to get the day started. The location on Central Street is definitely tucked away, not obvious, and I like that. The place isn’t enormous so does get busy quickly although there are seats downstairs. Food and drink are ordered at the counter and it’s brought to you, which works reasonably well although I’d quite like to see table service but I’m sure there are practical reasons why that’s not possible. So, lagging woefully behind the bleeding edge coffee hipsters, I can now declare Mrs Atha’s my favourite place for breakfast in Leeds, safe in the knowledge that they’ve probably spotted something new anyway and I can enjoy my flat white and bacon sarnie in peace. This entry was posted in Breakfast, Leeds by phildean1963. Bookmark the permalink. 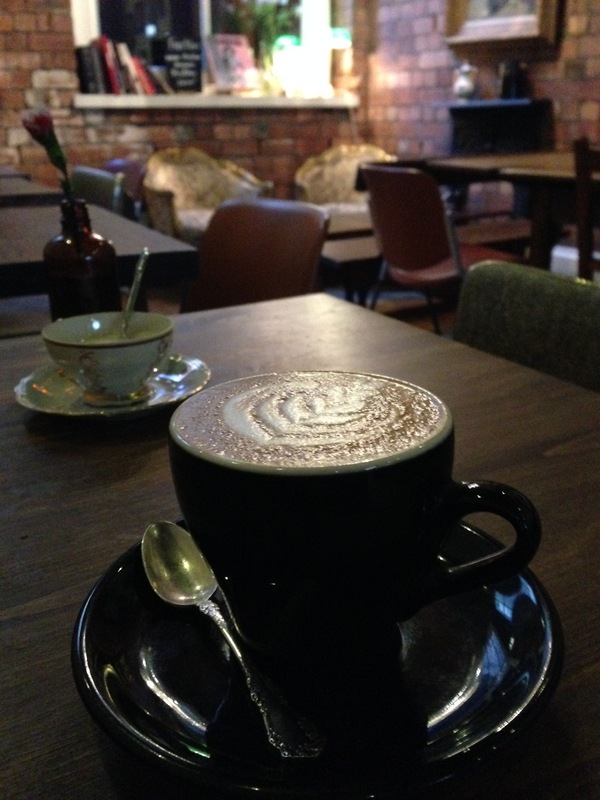 Why post about the best breakfast in Leeds and then deny us a photo of the little beauty? Come on… play the game.